It’s hot outside but even hotter in our studios (seriously, it’s H-O-T in there). Adding to the heat is Tarrus Riley, headliner of this year’s Montreal Reggae Fest, who has been kind enough to grace CKUT with his presence twice in one week. You can always hear Riley spinning in high rotation on CKUT’s Caribbean shows, and listeners and programmers never get enough of him. However, this week Riley is LIVE in studio. 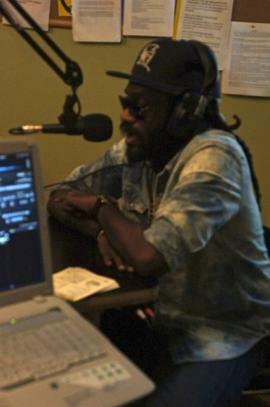 Tarrus Riley was on Positive Vibes this Thursday - ushering in the first day of summer. If you missed the show you can catch up by listening to the archives here. He’ll be back on the airwaves on Saturday, so be sure to tune in to West Indian Rhythms (Saturday at 6:00pm).